This article is sponsored by Best Buy. All opinions expressed are my own. I love the fact that there are so many apps out there that allow me to watch what I want, when I want, where I want. Wouldn’t it be great if there was a way to take the things we love to watch on our portable devices and get them on any HDTV? No upgrade to a SmartTV necessary? Now there is and Best Buy has you covered. Watch your favorite movies, shows, live TV, YouTube, and even see your photos on your TV from all your family’s devices. Google Chromecast works with over 2000 apps like Netflix, YouTube, and HBO Now. Set up is as easy as one-two-three. First, plug Chromecast into the HDMI port on your TV. Then, open the app of your choice and cast to the TV. Finally, sit back and relax. Told you, it’s easy. Bonus: You can still use your phone as you normally would while it is casting to the TV. So text, snap, and tweet away. As long as your TV has an HDMI port you are good to go. No need to buy a new TV. 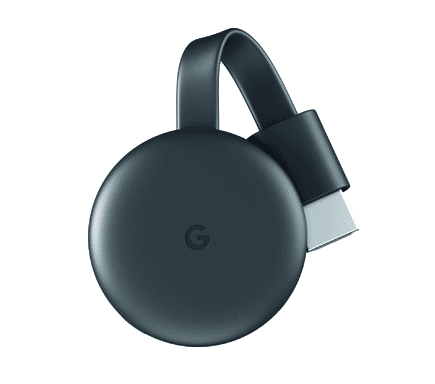 You can upgrade it for $35.00 with the Google Chromecast at Best Buy! It’s affordable enough to get one for each TV in your home. We use ours to upgrade our older TV in the basement. Now the kids can watch whatever they want while the hubby and I use the TV in the living room. Everyone is happy and there isn’t any sibling squabbles, at least about the TV! Like I mentioned above, the Chromecast easily connects to your high-definition televisions through the HDMI port. The high speed wireless connectivity works thanks to the built-in 802.11ac Wi-Fi. What will you stream using your new Google Chromecast? Get yours today at Best Buy! 5 Reasons To Upgrade To The HP Envy x360! Everyone is obsessing over this little baby! Perfect holiday gift! Although I don’t think we need any more technology over here, haha! I have a very own version of this product. I needed a new one and I’m glad to see they have made it better. I can’t wait to agree to this Chromecast! I am s behind the times when it comes to streaming and watching the latest shows and programming. I need to learn more about this and get in with the times. Google always creates some pretty amazing products. Looking forward to trying this and watching my favorite TV shows. That voice assist is a must. I love being able to be in my kitchen and be able to tell the gadget what to do! I don’t have to stop what I am doing to take care of things. Chromecast is such a handy tool to have. I have one, and we’ve used it multiple times to display things on the TV from the computer. I’ve heard a lot about Chromecast lately. I need to check into this and see if it can save us money on our streaming services. I love that google has entered this arena. I am sure this is a high-quality product and will make for an amazing holiday gift! This must be on everyone’s Christmas list this year. I keep seeing it everywhere and now I want one too. This seems like a good option for adding the latest apps to a tv that would otherwise be considered slightly outdated. So many options! Thanks for sharing this! I love our chrome cast. It is such a handy little tool. I cast from my phone all the time. Today is the first I’ve ever heard of this! It sounds like an interesting new way to get TV without a huge cable bill! I love all new tecnology things. We need to try this Google Chromcast! It is great that we can find it at a affordable price! I love that I can stream from my phone to the Chromecast. This would make a great Christmas gift. I haven’t Streamed anything but the more involved my son is on YouTube and watching Videos I would like to get him off it. So I think we need to venture into Streaming Movies and Music. I would definitely stream my music from Napster and Supernatural on Netflix. I love streaming! I have not seen a commercial in a very long time! I need to check it out, if streaming is possible then I need google chromecast. Because I can watch youtube, live tv etc.